Very enjoyable. The relationship of the boy with the tiger was utterly convincing and interesting. Release planned for Friday, October 24, 2003 at Post Office in Culemborg, Gelderland Netherlands. In the mail to fellow bookcrosser. thanks a lot bookcrosser! though the booker prize is not exactly a recommendation there are many people whose taste in books i do value and who spoke highly of 'pi'. apparently i'm not the only one who's curious; a spontaneous book ray list has formed. bookcrosser is very generous with (rabck) books, but strongly dislikes any form of administration - i wonder how s/he caught the bookcrossing virus? - so i offered to do the paperwork. pi is to be a bookray. but as much as i'd love to start reading, unfortunately other bookrings have acquired the next couple of weeks' reading time (everyone knows they prefer to come in groups). therefore i put myself low on the list and send it off to others first. - write something about the book. anything. good or bad, please let us know! Released on Wednesday, November 05, 2003 at controlled release in hilversum, Noord-Holland Netherlands. now that it's off, i'll have to swiftly pm the other participants about the ring order... had not taken time to do so yet. 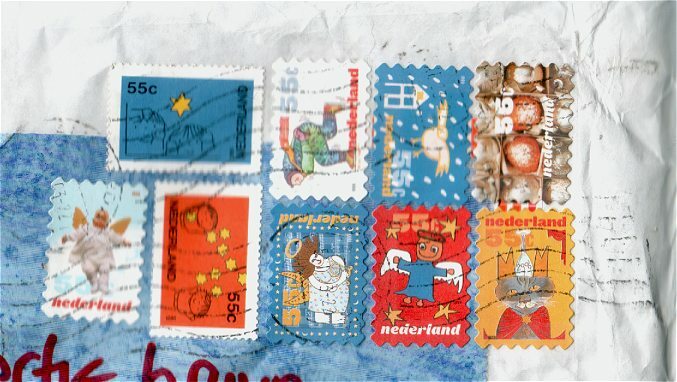 Dit boek arriveerde zojuist in een bubbel-envelop, versierd met een rijke collectie Kerstzegels. Omdat er zoveel mensen naar uitkijken, geef ik het prioriteit boven andere dingen die ik aan het lezen ben. Dat wil zeggen dat ik er vanmiddag aan begin. Ik vind de labelling nogal bescheiden, maar ik wil me niet overal tegenaan bemoeien in mijn eerste boekenring, of is het een ray? Dus ik laat het maar zo. This book just arrived in a padded envelope, decorated with a rich assembly of Christmas-stamps. Because so many are looking forward to it, I'm giving it priority above other stuff I'm reading. Which means that I'll start reading this very afternoon. I think the labelling is rather modest. But I don't want too meddle too much, in my first bookring, or is it a ray? So I'll just leave well enough alone. Een verbazend boek. Liefelijk en gruwelijk tegelijk. Ik heb het net uit, en ben er nog een beetje beduusd van; morgen meer. An astonishing book. Sweet and gruesome, all at once. I just finished it, and am still a bit overwhelmed; more tomorrow. Life of Pi is weer onderweg. Ik heb het vandaag op de post gedaan, maar ik wilde er nog wat meer over vertellen. Maar niet teveel, want ik wil het leesplezier van de medeboekringers niet bederven. Nou, ik vond het erg mooi, dat moge duidelijk zijn. In het eerste gedeelte stond naar mijn zin wel erg veel over God, een onderwerp waar ik als lezer niet zo veel mee op heb; later werd dat minder. Wat me erg aanstond was dat de tijger tot het eind toe een echte tijger bleef, en geen schootkatje of Disney-knuffelbeest werd. Een boek om nog lang over na te denken, en af en toe nog eens door te bladeren... Oh nee, dat kan niet, het is al onderweg! 'Life of Pi' is back on the road. I mailed it out today, but I was going to tell a bit more about it. But not too much, in order not to spoil fellow bookringers' reading pleasure. Well, I liked it a lot, this much should be made clear. The first part had a bit too much on God for my liking; a subject that doesn't do much for me as a reader. Later on, it got less. One thing that really appealed to me is the fact that the tiger stayed a real tiger till the end, and not a pet or a cuddly Disney-animal. A book to keep me thinking for a long time, and one to leaf through from time to time. Oh no, no can do, it's back on the road already! dank dank moem voor jouw vliegensvlugge post. nu lezen en mijn tripje naar dld plannen. ps bookcrosser is een heel leuke "zij", ik heb haar ontmoet op de eerste meeting vorig jaar in utrecht. Ooohh, I kept this book far too long, sorry. but I have finally read it and enjoyed it! A strange setting, which learned me a lot about (wild) animals and survivalling :-)) Maybe I'll visit a zoo again for the first time since "schoolreisjes" time when I HATED zoos (because I always got sick from the combination of busdrives and animal-smells). The end of the book was a bit disappointing. The whole time I've been asking myself what would happen to the tiger when they finally would reach land. And then.... no I won't tell, but it was not what I had hoped for. The story told as a story-in-a story wasn't too good either. I didn't read the italic written parts, until I had finished the whole book. On tuesday I will make the famous bicycle trip to germany, and if the wetter is bad, I'll send the book by post to heixly. Release planned for Tuesday, January 06, 2004 at postbox from Heixly in BOOKRAY, Bookray Controlled Releases. for paying postage to a foreign country. I really enjoyed in reading this book! 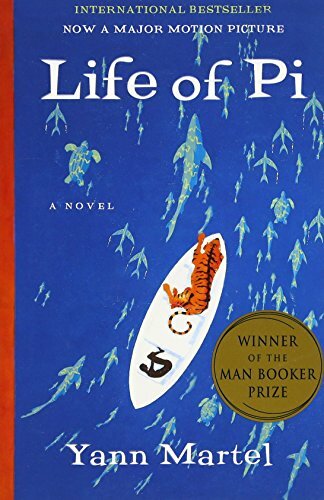 I liked not only the main story with Pi and the tiger on the lifeboat but also the little stories around about animals in the zoo, about god and various religions, about life and men. Sorry, that I kept waiting the following readers a bit too long, but now the ring resumes with sending the book to biba89! This book, with its beautiful watery cover, was handed over to me by the mailman today. It will be read soon! I became quite curious, after reading the posts from the esteemed bookcrossers who read the book before me. I agree with Moem, gruesome and lovely at the same time. Quite literal in its decriptions of brutal survival. And the image of the teeth wrapped in leaves is one I will not easily forget. Highly, highly recommended. Very convincing. I wouldn't know what to add here now, without spoiling fun for anyone. There is just one thing I'd have to disagree on - zoo animals are pampered, safe and cared for all their life, true, but usually they are bored upon the brink of madness. Released on Wednesday, May 05, 2004 at to fellow BookCrosser in Deventer, Overijssel Netherlands. Piscine Molitor Patel and tiger drift off in the direction of gerbie7 today. Godspeed, Pi! Beware of the tiger! Came back from Berlin to find this book in the middle of brochures, papers and other trash. Nice surprise. First finish another book, then this one will be on the top of the TBR pile. The extra-ordinary story of Piscine Patel and Richard Parker, praised by many, awarded with prizes. It took me a bit to get into. 10 pages at the time, but in the end it has cost me several hours of sleep. The intro drags on a bit, we have to get to know Pi apparently, but in my humble opinion it would have been as good had we just entered the story the moment the ship goes down. I still don’t understand how it is possible that Pi doesn’t find out for days that there is a tiger in his lifeboat. However the idea of the two of them together in a small boat is a great setting for a good story. Having finished the book, I don’t think I consider it the classic many hold it for. It certainly is a good book, it made me take the book from next to my book and read it in daytime, ignoring work and newspapers. To be a classic, it misses the depth. One thing it certainly does well is playing with the edges of reality. What is true, what isn’t? Yet it is funny to think about that dilemma anyway while reading a work of fiction. Released on Saturday, May 29, 2004 at Post Office in By Post, By Post Controlled Releases. Naar de volgende lezer in deze bookring. I won't get the slightest suntan here in the shade of Mount TBR. But Pi looks good, I'll start reading asap. After a rather boring start I enjoyed this story very much from the point where the boat sank. The interaction between Pi and Richard Parker is convincing and well told. Relating to other sentient beings is the one thing that helps us to survive, as Pi finds out. I don't agree with everything said about animals but that's beside the point. The blurb "A tale that will make you believe in god." is meaningless and goes against the grain with me; I can think about coincidence, reality and the perception of reality without religion. I just love bookrings, especially the ones I've totally forgotten that I signed up for. Thus, this book came as a complete and welcome surprise in the mail today. I'm currently in the middle of two other books, but couldn't resist reading the author's note, which makes me eager to finish my other books so I can read this one. More after I've read it. Thanks nrrdgrrl for arranging the ring, and thanks bookcrosser for making the book available. FINALLY got Pi in the mail to Lost Nomad today. Sorry to have held on to it so long. Like everyone else, I really enjoyed this book. I agree with biba that despite what the writer says, zoo animals are not happy. Otherwise, why do so many of them do that neurotic pacing back and forth? And, I agree with Plinius. NO story is going to make me believe in God. But I let's not get into that here. I think Gerbie said it well: the book does "play with the edges of reality," whatever reality is. I don't think I should write book journal entries after midnight. One of the best books i've read in a whille.. i love this magic-realism type of books. As soon as i have the address for the next, Pi will continue his journey! This book was waiting for me when I came home this evening. I'm very curious about it and it will be the next book I'll be reading. I looked forward a lot to reading this book and I when I finally received it I couldn't get myself to start reading it (how curious). Eventually I did start reading and it was not bad at all (I liked it). I could very much identify with Pi being frustrated about being teased about his name and I was very amused by Pi practising three different religions. Finally someone who does something his own way and is not influenced by this parents and religious counselors wanting him to conform to their opinion of how things should be! I agree with readers before me about the story not making me believe in God. I would put it even stronger and say it reinforces my belief in taking matters into your own hand when faced with problems and relying on your own strength and knowledge to get you out of a sticky situation. At first I did not know whether I was going to like the part of the book after the ship sank, but soon I was curious what would happen next and started making more time to read. While I was reading the book I saw a program about surviving at sea on Discovery channel and I understood better what kind of things were aboard the lifeboat. I'm not sure yet if I'll have to mail this book or if I can give it to Suzy26 at the meeting in Tilburg next week. I will pm her if she has decided yet about going. This book is going with me to the bookcrossingmeeting at bookshop de Zevensprong in Tilburg tomorrow. Korenmaat will take it with her to Suzy26 (thanks). I liked this book immensely! What an astonishing story! So original, so rich in detail. I could really imagine myself on the raft with Pi in this enormously wide, blue and quiet ocean. It would seem impossible to survive on the ocean for 227 days with a tiger for company, but the way it is told it becomes quite plausible. I like the manner in which the author describes the way this story came to him. It makes you believe that this is a true story, but then in the end these Japanese tapes are throwing a different light on the whole matter again. It leaves you with the feeling that you have been had. Well, anyway, this story keeps you thinking long after you have read the last sentence. Book is in the mail to nrrdgrrl. ha, pi is back in his temporary home! thanks all for taking part in this ring. it's great for the appetite to read all your opinions. and once i'm reading pi you'll automagically see whether i agreed or not! Released on Tuesday, December 28, 2004 at about 8:00:00 AM BX time (GMT-06:00) Central Time (US & Canada) at bookring in bookring, Bookring Controlled Releases. lot12 would like to read it too, so pi's travels in the wilds of south africa have to wait a bit. edit, 2 jan.'05: the entry above was a bit optimistic, as the mailbox was blown up with fireworks before i had the chance to mail this book out. and the post office is closed all the time due to the holidays. sigh. anyway, this evening the remaining mailboxes have been reopened and i'm sending this book out right away! Sent out the day before you left and it arrived here the day before I leave, but for me it's only a short holiday. Thank you for sharing, nrrdgrrl! I'm looking forward to it. Well, I read the book during my holidays and afterwards read all the journal entries for this ring and two threads about it on the Dutch forum (http://www.bookcrossing.com/forum/15/1511421/subj_-Life-of-Leven-van-Pi-vraag en http://www.bookcrossing.com/forum/15/623018/subj_-Life-of-Pi-(spoiler!) ). I wanted to read this book when someone told me the story is about truth and beliefs. As my studies had a lot to do with those two things, I'm very interested in those themes. I read all the above mentioned things about the book, because I wanted to know what other people thought about the trick Yann Martell plays on us. But hey! Nobody's commented on it. Apparently I've read it differently, although I thought the trick was too obvious to be nice. What do I mean? (CAREFUL, THIS MAY BE A SPOILER IF YOU HAVEN'T READ THE BOOK) I mean that, in my opinion the whole book is about religion. About why we should or could believe in stories about God. 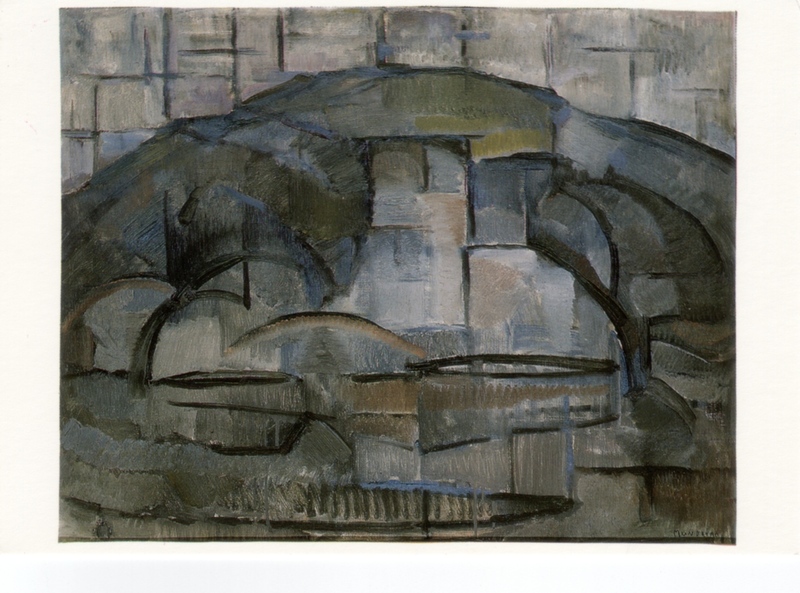 First and foremost he shows this by showing us in several examples that what we don't see isn't necessarily NOT there. And when you find out something ís there, you will see the evidence for it everywhere. The second thing is that there can be stories which cannot be prooved one way or another. Which of the stories or explanations you believe depends on what you want to believe. In this case the story of God is supposed to be the better one (Pi asks the japanese which story is the bétter one: the one with the tiger or the alternative story. The Japanese agree that of course the story with the tiger is the better one.) What is meant by 'better' isn't really clear. It seems to me he means nicer or better told. I call it a trick, because I think what he does is very rhetorical. He shows us one way, the way to God, though I think, and he says as much, that his reasoning can be turned around to proove exactly the opposite. He uses arguments and methods that can be and are used to show the opposite. This does not mean that I'm against his reasoning. I like it. The way he views concepts like 'truth' and 'believe' and 'fiction' is the way I see them too. I think he gives a well-written, easy readable example of how we can view the world and the things we believe are true in a postmodernistic way. He isn't postmodernistic, alas, in the obvious way he brings the message and only showing one way (but then I'm probably spoiled by Paul Auster). But I'm probably wrong about that last comment, because a lot of people read this book different than I did. About the book itself. I liked the beginning of the story, the Indian feel, the absurdistic stories that surround Pi, but they were criscrossed by bits about zoology and religion, which were in themselves perhaps interesting, but I wasn't interested in reading them in the midst of a novel-story. When the ship sank I was amazed about how well he describes the survival. I was convinced by Pi's story, even the cannibalistic island (though I had the feeling it was a reference to the paradise-story) I found believeable. I enjoyed reading it, especially in the parts where I wasn't disturbed by his trick. All in all, a nice book, though not a classic or one of the best books I've read in a long time. Thanks for sending it to me, nrrdgrrl! edit: Oops! Sorry that I wrote so much. sorry that you wrote so much?! people should apologize when they don't! pi is back here yet again... third time lucky? what to add after all these reviews? i understand (once again) i should dive into paul auster's work, as my overall impression is much like lot's. the underlining of the importance and relativity of viewpoint and narrator is what made the book interesting to me. taking this with me to my first south african bookcross meeting. if you read this, you're welcome to join us! Stimulating. The book starts of by being realistic, then hyperrealistic and eventually surrealistic. 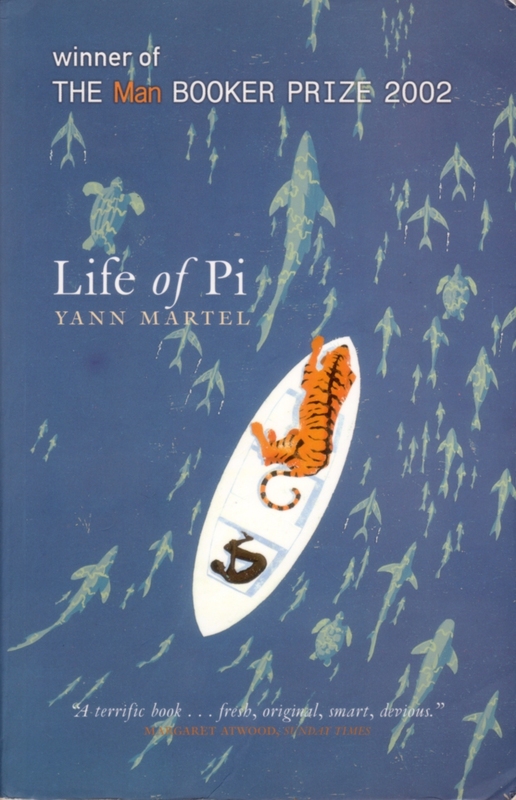 This makes it difficult for me to reconcile certain images: for example, right in the beginning there is a beautifully described scene giving Pi's reaction when he is "berated" by a waiter in an Indian restaurant for wating his food, using his fingers; later on he has no compunction (labeit without choice!) in abandoning established eating habits - vegetarianis. His "justification" just doesn't ting true. I did appreciate, however, the building up towards the end. A continued line of tension is created by a series of matter-of-factedly told anecdotes. Sometimes these are so thrown away that their significance can be lost. In thin, for instance, of the teacher and the Imam. Not only do they have the same name, but their influence on Pi is the same (or rather, has the same effect) on Pi. I finished this book in one session: I just couldn;t put it down. I passed the book on to a neighbour (who, unfortunately, does not have access to the internet). He will, however, pass the book on to someone else once he has finished. A novel take on being a survivor at sea - hoped that devouring turtle meat and meerkats is something i'm not ever going to do!! Is it the tiger in Pi's nature? The end discussion with the Japanese men showed up something in our nature which also becomes hilarious!! Easy to read.